The average person spends over two hours online per day, and the web recently overtook television and radio as the number one source of news content. These figures typically increase year-on-year, therefore making the internet one of the most powerful distributors of information. Many brands now rely on the internet in order for their businesses to flourish, and new digital marketing techniques are constantly coming to light as online trends shift and change. If a business wants to compete and stay at the top of their game, they have to prove they can adapt quickly and efficiently. One of the newest and most popular digital marketing trends comes in the form of sponsored content. For a long time, businesses have been able to pay search engines like Google to appear higher on the results page, but now sponsored content has shifted to social media. Twitter, Instagram, Snapchat and Facebook allow companies to pay a small fee in order to boost their posts, thus reaching a wider audience and creating more impressions than a standard post which relies solely on shares. Video content has never been more popular. YouTube has exploded in popularity, with many young people favouring watching their favourite ‘vloggers’ (video bloggers) over watching television. Views generate money, and the more views you get, the higher your potential revenue is. Behind-the-scenes, vlogs and Q&A videos are amongst the most popular, and it’s a great way for businesses to reach their audience on a more personal level. Blogs are one of the easiest and quickest ways for brands to pump out good quality content and interact with their audience about current issues concerning anything related to their business. People don’t tend to have long attention spans, so the writing has to be short, snappy and straight to the point. Businesses can sometimes come off as machines without much personality, but a bit of sharp humour and light-hearted content that still serves its purpose to a professional standard can make people feel like they know not only the business, but the humans behind it. Geofencing is a relatively new tool that takes advantage of mobile marketing. Companies can set geofences (a digital boundary as large or as small as they like e.g. as big as a city or as small as a street). When a customer or potential client enters the boundary of your geofence, adverts related to your company will appear on their internet feeds with things like coupons and promotional content. There are an abundance of geofencing techniques to choose from; it’s all about picking which one will serve your clients the best. Finally, the last digital marketing trend that companies would be foolish not to invest in is an app. There’s an app for just about everything these days, from banking, games and music to food chains and cafes. Apps mean people can access your business on the move, quickly and efficiently. There’s no restriction on when people can view your brand. The most well-designed apps are often the simplest and easiest to use, and free of charge. What you spend on creating your app will surely be earned back quickly once people start using it for purchasing goods. These are just a few of the most effective digital marketing trends of 2018 that have been proven to work time and again for all types of businesses. Why not take advantage and use them to grow your business? Although digital trends are extremely important to keep on top of for business growth and promotion, face-to-face exhibitions are still the best way to market your brand and make people aware of who you are and what you do. Compliment your digital presence with a physical presence and make yourself known. XL Displays supply a vast range of exhibition stand solutions designed to get your brand maximum exposure that will get you a return on your investment. Linked pop-up exhibition stands are one of our bestselling and most innovative tools you can employ to make your presence known at any event. They operate on a modular system, meaning they are completely reconfigurable and elements can be added or moved to create a bespoke display stand that can fit any exhibition space. We supply linked display stands in a variety of shapes, including straight, curved, L-shaped and U-shaped. 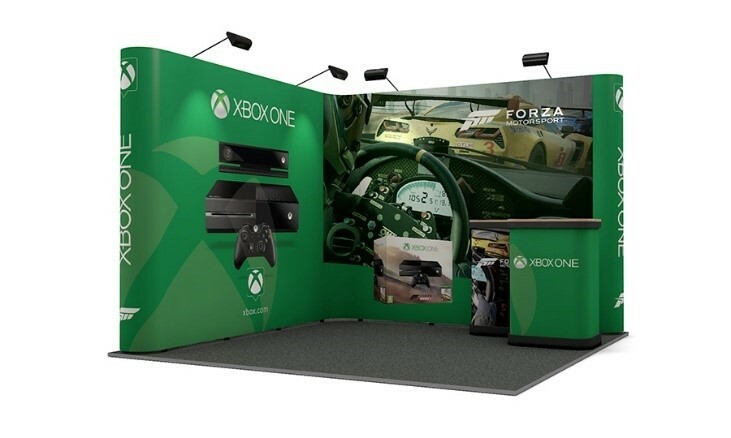 Pop-up displays are a cost effective way of creating large format displays, but are also ideal for a brand that keeps growing and evolving and requires marketing tools to keep up. Make sure both digital and physical aspects of your brand match and invest time, energy and forward-thinking into both. For more information on our linked pop-up stands or exhibition stand solutions, contact us or call us on 01733 511030.